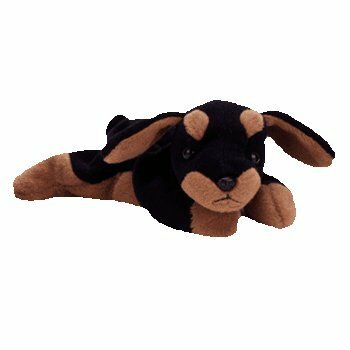 Doby is made from a black material with a tan coloured muzzle and tan paws, eyebrows and inside his floppy ears. He has black button eyes and a black nose with black stitching for his mouth. Until he sees it’s time to protect you! Doby was released on 1st January 1997. His birthday is on 9th October 1996. Doby is a Doberman Pinscher breed of dog. He was retired on 31st December 1998.